Every good chef should know how to cook a pork roast. 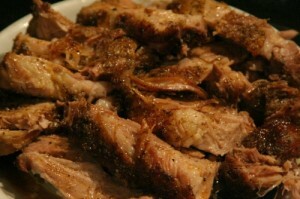 While there are many tasty, simple, and inexpensive recipes on how to cook a pork roast I like to stick with the basics. I will offer you my simple recipe below. I call it Simple Southern Pork Roast. Simply place your pork roast on a bed of onions in a crock pot. Pour one can each of cream of celery soup, cream of mushroom soup, and your favorite can of gravy. Add carrots and potatoes if you like or simply cook as is. The roast should be cooked for 6-8 hours in a crock pot on the low setting. This roast is best served with white wine or good old fashioned southern sweet tea. Since the roast is not fried and is slow cooked with soups it is much healthier than most southern meals. Enjoy!